Don’t forget! You’ve still got time to register to win a free copy of Fatal Tango by Wolfram Fleischhauer. 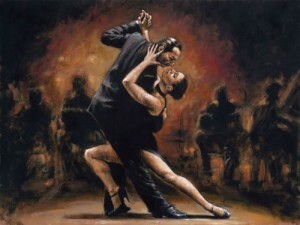 Today, I wanted to share some cool information on the language of the tango and the codes that dancers use. This was provided by the author, although the illustration is from a painting by Fabian Perez (more info here). In real life, tango can also be in code. Fleischhauer interviewed professional dancers in Buenos Aires and asked them to reveal their personal tango notation systems. Most couples have some kind of system to memorize their complex choreographies. In the example below, Fleischhauer shows from a dancer’s perspective how tango code might reveal the truth about a romance—will it be a thriller, or just more filler? Step: Tijera — Scissor: A movement, usually danced by the man, in which an extended leg is withdrawn and crossed in front of the supporting leg without weight so that it remains free for the next step or movement. Step: Enganche — Hooking; coupling; the little hook: Occurs when a partner wraps a leg around the other’s leg, or uses a foot to catch and hold the other’s foot or ankle. Step: Adorno — Adornment; embellishment; decoration: Complicated or syncopated movements which the dancer uses to demonstrate their skill and to interpret the music. Step: Desplazamiento — Displacement: Displacing the partner’s leg or foot using one’s own leg or foot. Step: Ocho Cortado — Cut eight: change of direction. Typical in club-style tango where many such brakes are used to avoid collisions. Describes a movement done on either foot, pivoting forward or backward, and going either left or right. Step: Rabona: — A walking step with a syncopated cross. Done forward or backward the dancer steps on a beat, quickly closes the other foot in cruzada, and steps again on the next beat. Adapted from soccer. The music stops. We stand in a tight embrace, maybe a little too tight now, leaning on each other as the cortina jingle sets in. “Otra vez?” he asks as the cortina fades and tango music sets in again. “Once more?” And then the penny drops: tijeras, enganche, adorno, desplazamiento, ocho cortado, rabono… otra vez? T.e. a.d.o.r.o… I adore you! What a charmer.